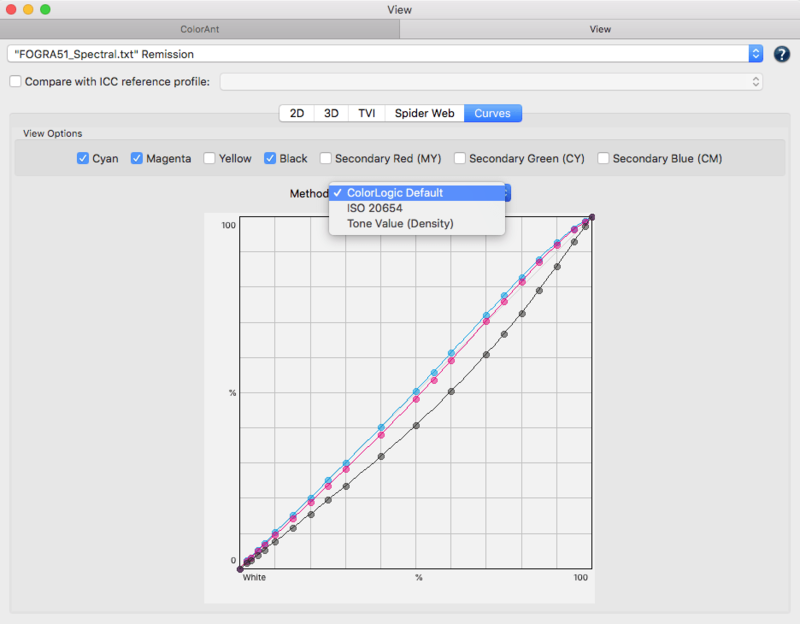 To view a measurement data, select the data in the Data Sets area and open the View window. 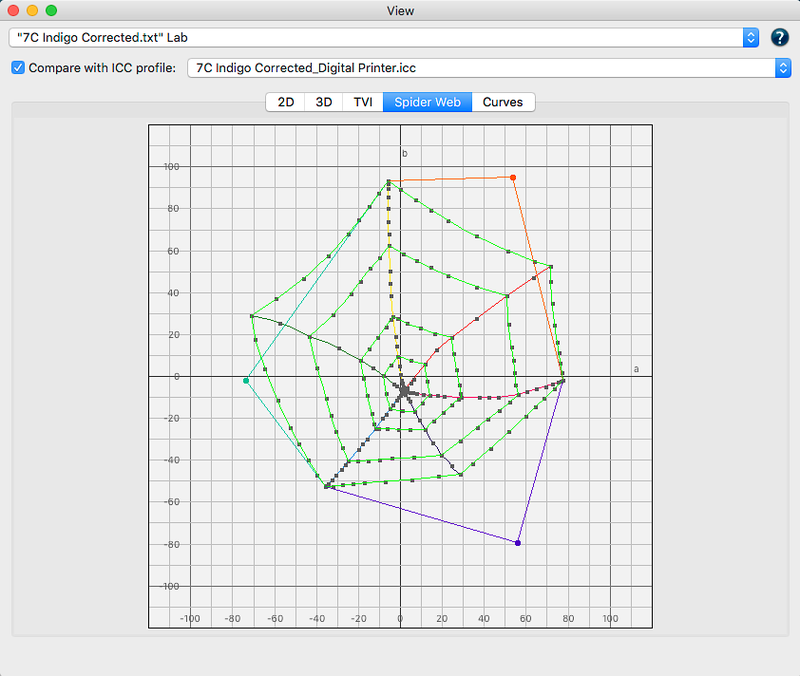 Five different options allow for a quick overview of all color patches in the measurement file: the 2D view shows the reference and the corresponding Lab values for each patch, a 3D rotating view of the color space, TVI displays the curves for each channel, Spider Web and various Curves of gradations. Color filters: Using the checkboxes colors can be selectively displayed in 2D and 3D view. All other color patches are then hidden. 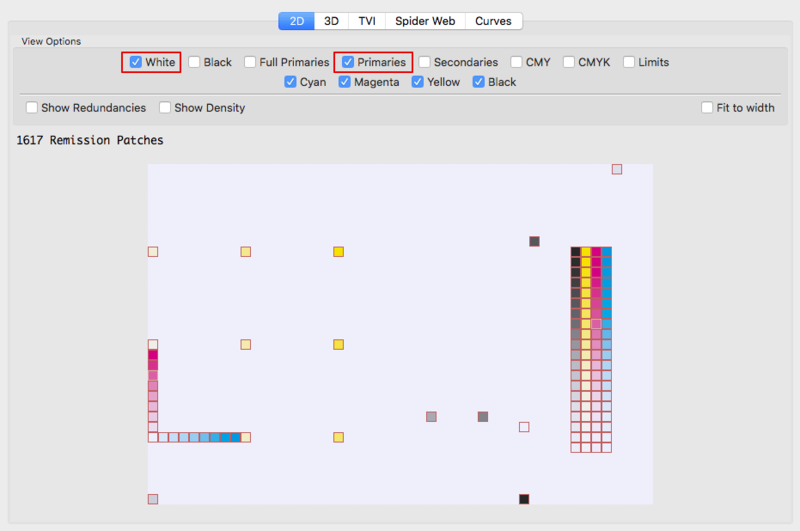 This allows to immediately find selected colors in the test chart layout the 2D view. 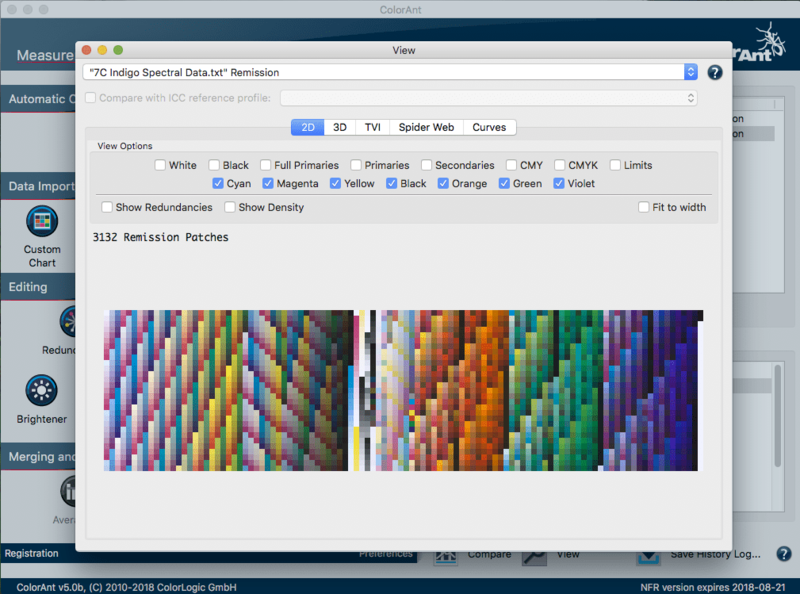 In 3D view, the color body defined by the color filters is displayed. This way, the Full Primaries, Limits, Primaries, Secondaries, White or Black can be viewed separately. With Multicolor data, it is easy to recognize in which areas the additional colors extend the color body compared to CMY or CMYK. There are some dependencies between the color filters, so selecting a certain color filter may automatically activate another color filter (or even several others). For example, if the Secondaries checkbox is activated, the Primaries and White color filters are also automatically activated. They can be deactivated if only two color combinations (Secondaries) are to be highlighted. Color channels: By selecting color channels, either all color patches or only the color patches of the selected color channels can be displayed. Color channels can be combined with color filters so that, for example, only the Multicolor Primaries or Secondaries can be displayed. Duplex and triplex colors can be displayed by individual selection of suitable color channels (for example, Cyan + Black shows duplex colors and Cyan + Magenta + Black shows triplex colors). Show redundancies: Marks all redundant patches in the selected document providing information about the colors and their location. These patches will be adapted when applying the Redundancies tool. Viewing Remission Data: Roll over a color patch to see the Lab measurement value and reference value of the patch. Spectral data will also be marked as Remission. When spectral data is present, switching to Show Density displays the density of a color patch. Clicking on a color patch defines it as reference and the DeltaE index will be reset to zero. Move to another color patch without clicking and the color difference between the two patches will be visualized. Double clicking on a color patch in the 2D tab will open a separate dialog called Color values, where the Lab value is displayed. You may change that value and apply the changes by clicking OK. Note: Even for the manual editing of Lab values we use the spectral data and the spectral characteristic of this data will remain. In the 2D view, individual color patches can be edited or deleted by selecting the patch and right-clicking to open a context menu. Using the context menu of the selected spectral color, you can Edit, Add, Delete, Copy, Cut, Paste color patches and open the Spectrum dialog with the reflectance curve of this color. 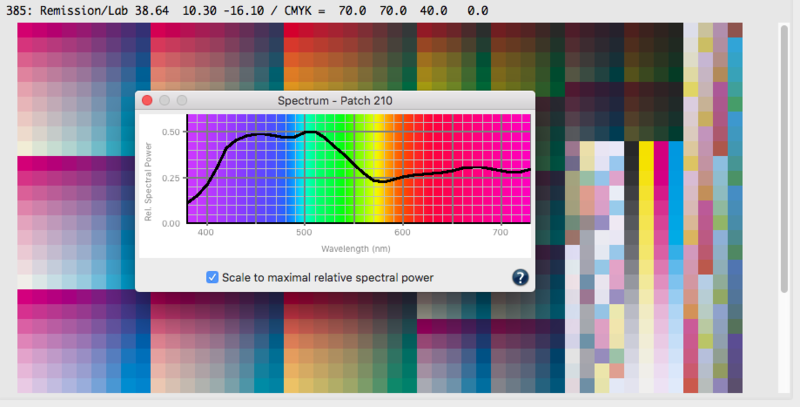 Note: Whenever the Spectrum dialog is opened and scroll over patches in 2D view, the spectral curves of the related color will be displayed. 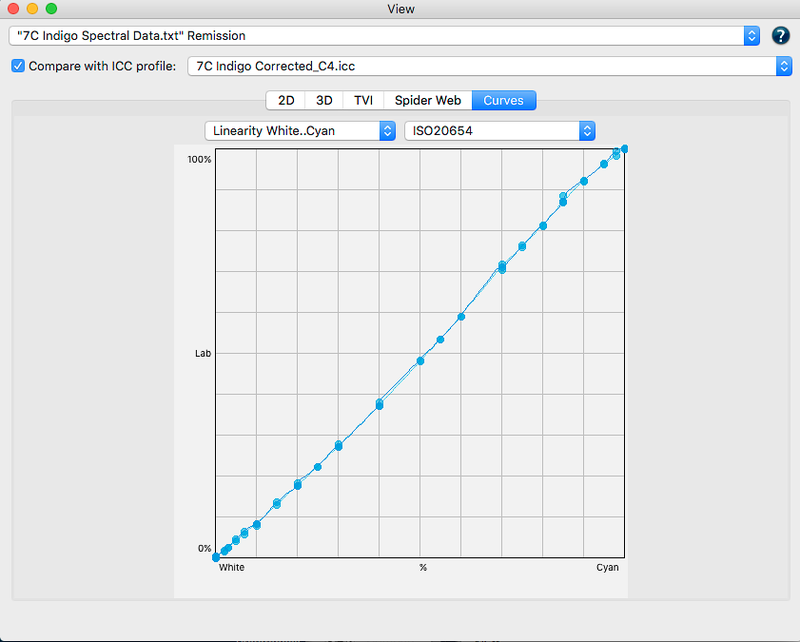 Density values can be calculated and displayed in the 2D view if spectral measurement data are available. 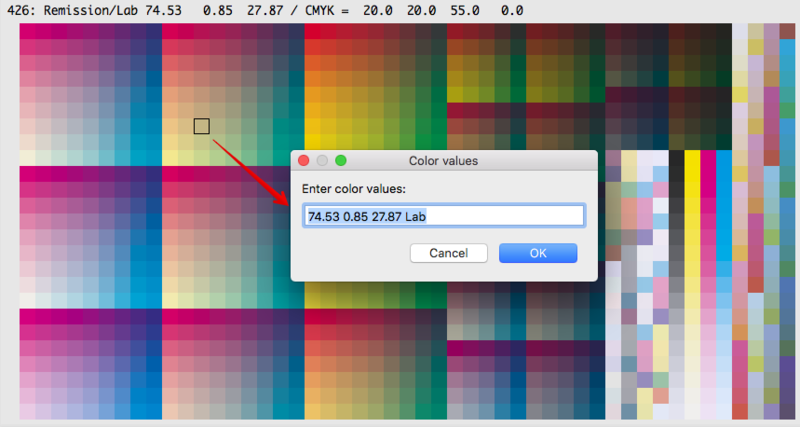 Activate the checkbox Show Density and navigate the mouse pointer over the color patches to display their CMYK density values. Status-E: The default setting in ColorAnt, which is mainly used in Europe. Status-T: Mainly used in America, with slightly lower yellow density values. Status-A: Used in the photographic industry. Use it with RGB printing systems. 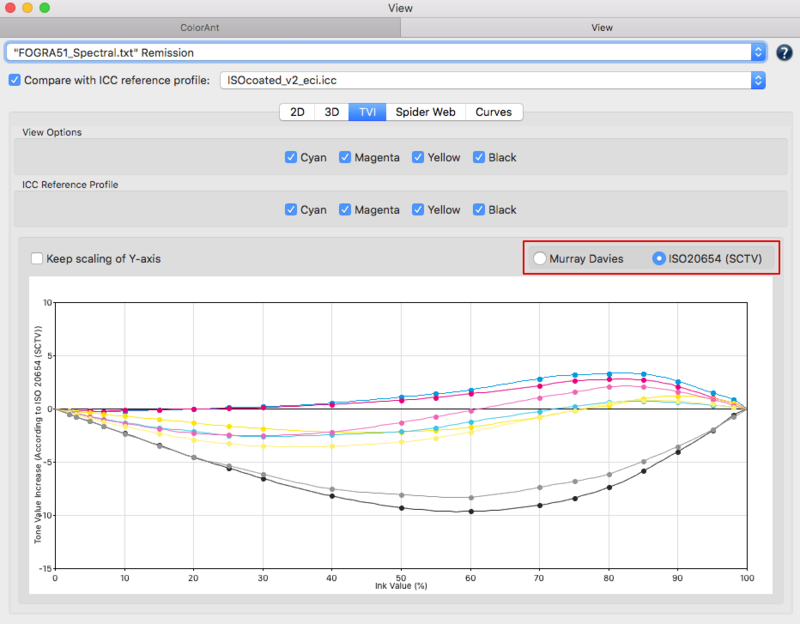 Maximum: For Multicolor measurement data, automatically uses the maximum absorption in the spectral values instead of the specified CMY filters for calculating the density. Note: The density values of the solid tones are also displayed in the PDF Report. You can save the pure density values of your measurements as separate file by selecting Export Density from the File menu. Turn the color patches into the desired direction in 3D view by clicking and dragging. By dragging the gamut, the color space is rotated in that direction. A single click will stop the auto rotation or it will stop automatically without user intervention after one minute of rotation. Increase or decrease the view by using the right side Zoom slider. Enlarge or minimize the color patches by using the Point Size slider. 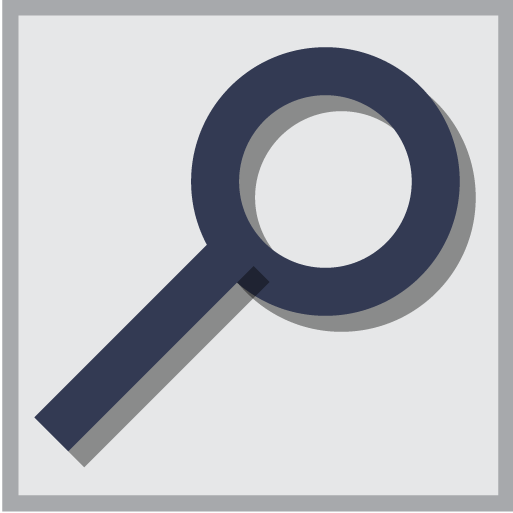 Compare with ICC profile: Enable the checkbox to select an ICC profile from the drop-down list. The gamut of the selected profile will be shown as transparent light gray allowing to comparison with the measurement data. Analyze Tone Value Increase curves (TVI). Whenever the TVI tab is opened during editing of curves or any other correction which will affect the TVI, the result is displayed. View Options: The checkboxes depend on the primaries of the loaded measurement data. The check boxes for CMYK and Multicolor files show or fade out single curves. By activating the checkbox Keep scaling of Y-axis the TVI curves will be visualized in the diagram in the best possible way. The scale factor of the Y axis depends on the measurement data and ensures the most precise and largest view of the curves. Deactivating the checkbox prevents the automatic adjustment of the Y axis with each new data. Sometimes this eases comparison of different adjustments. Use the radio buttons on the right side of the window to switch between the typical density-based tone value increase curves according to Murray Davies or the modern colorimetric tone value increase curves according to ISO 20654 (SCTV). Linear tonal growth curves according to ISO 20654 would show a straight horizontal line in this diagram. Measurement data which contains only CMY (no black) or RGB, can be optimized with ColorAnt. Besides the CMY or RGB curves, an additional composite gray curve will be visualized in the TVI tab. TVI curves will always be shown with internal redundancy corrections in the View dialog. This avoids any strange visualization in case the similar color values strongly differ, especially for paper white. Compare with ICC profile: Select an ICC profile from the drop-down list. The curves of the selected profile will be shown in a lighter color in addition to those from the measurement data. 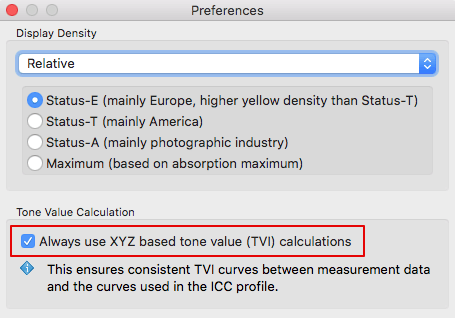 Tone Value Calculation: The visualization of TVIs can be modified with the options in Preferences. Curves may be calculated and visualized by using XYZ or spectral data. Note: The standard setting in ColorAnt is to calculate the curves based on the XYZ values. This allows a consistent view of curves either based on measurement data or by the ones based on the resulting ICC profile. By disabling the checkbox in Preferences, curves will be calculated by the density method if spectral data is available. This method is more common to the one used in print process control. Keep in mind that both the XYZ and the density method are not good indicators for how the curves for spot colors will actually look. Both methods do not work well for non-CMYK colors. Refer to the Curves dialog instead. This is a top view on the color space in an a*-b* diagram. The measured or optimized color patches are arranged in a spider web. Compatible to the other views, you may check changes in the View dialog by selecting one of the adjustments in the History. In the spider web all primary and secondary gradations are highlighted in corresponding colors (see also the screenshot of the CMYK data). 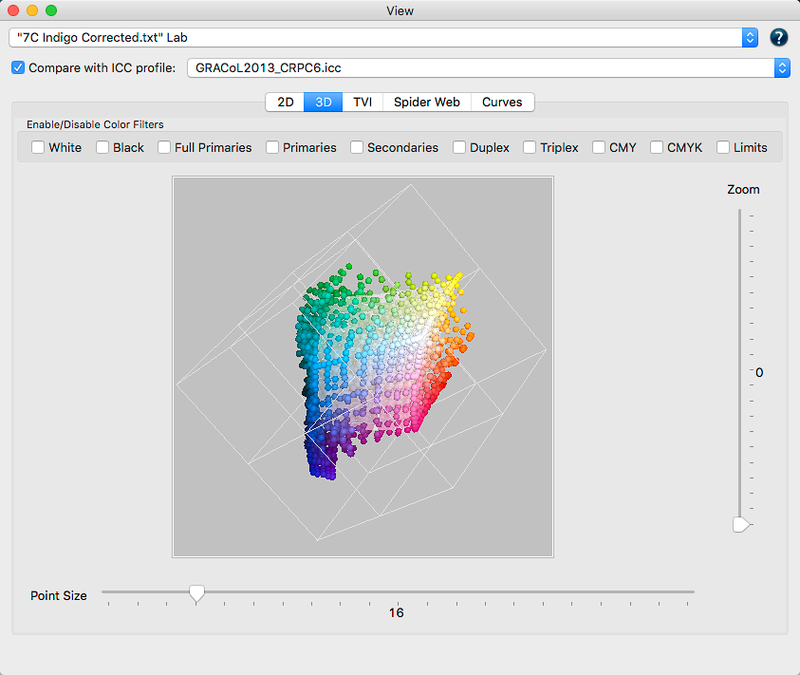 Spider Web: Displays the measurement points of the CMYK data and the full tones of the additional primaries. There are straight colorized lines from those primaries to the next two closest. Viewing Multicolor data would look similar to the example below. These lines only represent a rough representation of the final color space. Nevertheless it is a great indicator of how those additional colors will expand the color space. Note: CoPrA supports three main chromatic primary colors which should span a suitably large gamut encompassing the gray balance. Typically this is CMY but it can be any other appropriate chromatic color combination. Black can be added optionally as a 4th channel. If black is used it must be the fourth channel. Up to two gamut extending colors can be used in between each section of the main primary colors. Following this approach, printer profiles of up to 10 channels can theoretically be created by CoPrA 5 and higher. However, it is not recommendable to use printer profiles with more than 8 channels in production as every additional channel increases the profile size exponentially so that either a very low grid size or an exorbitantly large profile had to be used. Compare with ICC profile: Select an ICC profile for comparison in the drop-down menu. The color space of the selected ICC profile will be visualized in green in addition to the measurement data. This feature is helpful to compare different color spaces and compare standards such as a house standard vs a print standard. The Curves tab displays the linearity curves from white to 100% of all primary colors including Multicolor data and with CMYK data, the secondaries. 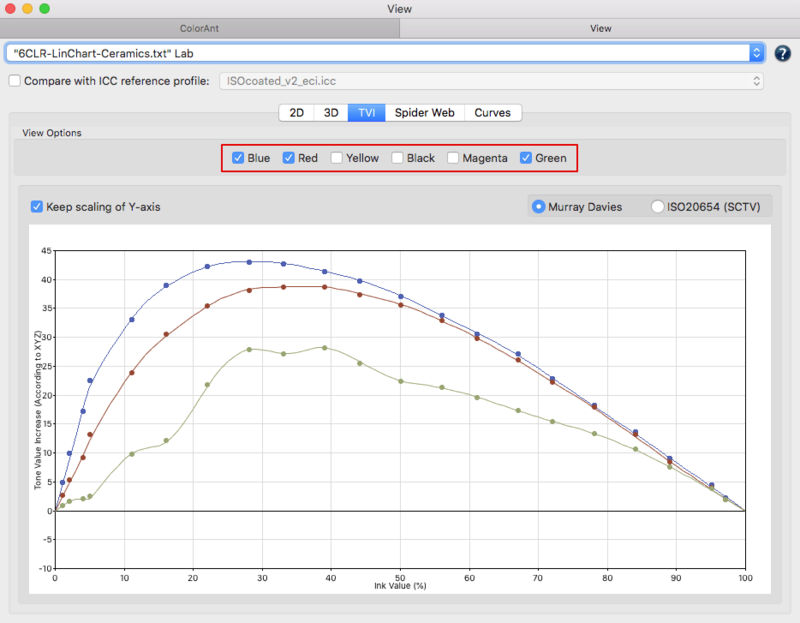 The smoothness of gradation curves can also be displayed using three different methodologies. Three different methods can be selected with the ColorLogic Default being the default option. ColorLogic Default: Views the curves in colorimetric linearity based on Lab /dE-76 and means that a 50% value of a given primary has the same distance to left value (white) and the right value (full tone) if it sits at the midpoint of the graphic. Nowadays modern RIPs linearize primaries based on colorimetry methods. A fully linear curve (45 degrees) points to a perfect colorimetric linearity. ISO 20654: Can be used to display how the gradation curves of primaries would look if regarded under the aspect of colorimetric linearity. A fully linear curve (45 degrees) points to a perfect colorimetric linearity according to ISO 20654. Note: Density based methods like Murray Davies do not work well for non CMYK colors. The IS0 20654 also known as SCTV method (Spot Color Tone Value) is an alternative method to display tone values of spot colors. The curves shown with ColorLogic Default and ISO 20654 are similar methodologies. ColorLogic Default takes the hue of the primary into account, which is not the case with ISO 20654. Tone Value (Density): Is the tone value curve based on density. It’s a different view of TVI diagrams. This view has been added for a better comparison of colorimetric methods. Compare with ICC profile: Select a profile for comparison of the curves in the drop-down menu.